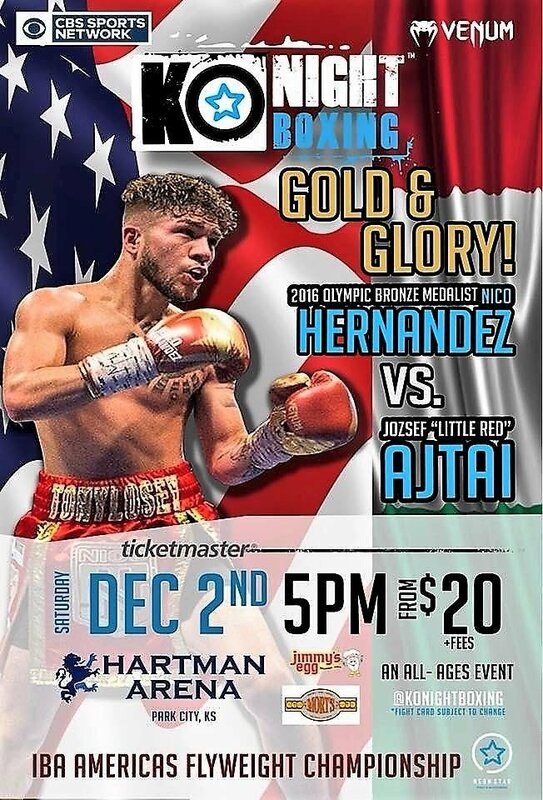 Nico Hernandez injured, fight against Jozsef Ajtai postponed until Feb.
Due to an injury suffered by 2016 Olympic bronze medalist Nico Hernandez last week at training camp, this Saturday night’s “KO Night Boxing: Gold & Glory” card, presented by KO Night Boxing LLC, has been postponed until February 10, at the same venue, Hartman Arena in Park City, Kansas. The 21-year-old Hernandez was scheduled to headline the event in his hometown against Hungarian flyweight champion Jozsef “Little Red” Ajtai (19-9, 12 KOs) in the eight-round main event for the vacant International Boxing Association (IBA) Americas flyweight championship. The promoter plans to keep the card intact, as much as possible, and he is hopeful that Ajtai is available to challenge Hernandez for the IBA Americas title. TIckets to the December 2nd event will still be honored at the February 10 event. If ticket holders, are unable to attend the new event date, full refunds will be offered at the point of purchase. Tickets will remain on sale for the February 10, 2018 event date. You are here: Home / Press Room / Nico Hernandez injured, fight against Jozsef Ajtai postponed until Feb.